Established in 1890 by C.D. Barr, Sr., Barr Funeral Home of Leesville, SC, has the distinction of serving this area for well over one hundred years. As a young man, Mr. Barr was a farmer, cotton buyer, owned a mercantile store and eventually began a saw mill cutting long needle pines. As these trees grew scarce, short needle pine was used and this type of developed lumber did not sell, Barr's sawmill began cutting short needle pine and he began making store show cases and coffins. Many of these show cases are still in use, and making coffins marked the beginning of the Leesville Coffin Factory and eventually Imperial Casket Company. Through the sale of these coffins, Barr Funeral Home was also founded. Following the chain of events, which precipitated the start of the funeral home, Barr began to embalm bodies in the home. A door would be removed from its hinges and placed on sawbucks to be used as a cooling board for the body to be "laid out" until the family came to Barr's Store to purchase a coffin. Clyde Barr once said, "buying a coffin is like buying a pair of shoes; coffins are made to fit the deceased." Eventually the embalming process was moved from the home to the upper level of the Barr's Store, which was located in the Main Street shopping area of Leesville. A few years later the thriving business was moved to the original C. D. Barr residence on Main Street, and in 1951 was moved next door to its present location at 256 Main Street. Sadly the first funeral held in the new facility (which was C.D. Barr home) was that of its founder, C. D. Barr, Sr. This building is located in the Leesville College Historical District and is on The National Register of Historic Places. 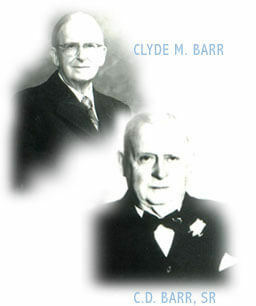 His son, Clyde M. Barr, had worked with him at the funeral home during his childhood. After graduating Clemson College with a degree in Civil Engineering, Clyde returned to the family business, taking over following his father's death. During his lifetime, which spanned 87 years, Clyde Barr provided the same dignified service to every family who sought his assistance. Many changes have occurred since Barr's first opened their doors. Most of the bodies they embalmed were taken home to await burial. Although this custom is still acceptable, most prefer the convenience of the funeral home. Horse-drawn hearses have long been replaced, as have the wooden coffins. Coffins were then "fitted" to the individual, while today's caskets are made more uniformly and are constructed from hardwoods, fiberboard, and metals such as copper, bronze, stainless steel, and steel. Through all the changes that Barr-Price Funeral Homes have been witness to, the one thing that has not changed is the quality of service given each individual. The business motto, "We serve others as we would be served," is also tempered with compassion and dignity. Even though Mr. Barr was not as active as he got older, people still insisted on doing business with him. He always treated everyone with kindness and understanding, as Barr-Price does today. He came to the funeral home everyday until a few weeks before his death. Mr. Barr was very dedicated to his work and his community, and the success of the funeral home is a tribute to him and his father. In 1972, Landis Price, fresh out of Gilbert High School, started to work for Clyde Barr, pruning shrubbery, washing funeral cars and working at funerals while attending Midlands Tec. He wanted to be an undertaker since grammar school and he became a Licensed Funeral Director in 1978. Price purchased the business in 1985 and changed the name to Barr-Price Funeral Home in 1988. One of his dreams was to expand the business, which became a reality, with the opening of Barr-Price Funeral Home of Lexington in 1997. That facility is located at 609 Northwood Road, Lexington, South Carolina. Barr-Price has the best of both worlds in the funeral industry. The Batesburg-Leesville location is the traditional colonial style home while the Lexington location is a modern brick facility. Both locations are decorated with the period of the building. Barr-Price Funeral Home is the oldest family owned funeral home in the Midlands of South Carolina. Quality service, kindness, dignity and compassion have been very much a part of our business for the last two centuries and will continue to be so in this century. The addition of Palmetto Cremations in 2006 has brought Barr-Price Funeral Home to the forefront of funeral services that are available to families in our area.